We often get asked how ChromaBlast compares to other methods of decorating cotton. Our Sublimation and ChromaBlast expert, Tom Chambers, wrote the following, which deals with some of the most popular cotton decoration techniques. Screenprint requires a substantial investment in equipment and ink, and has a fairly medium to heavy feel, with clear, sharply defined edges and lines in the design. It is best suited for clipart type images in limited numbers of colors, in fairly significant quantities. Full color images in screenprint must be done in a 4 color process, which will leave a visible dot pattern in the design. In smaller quantities, screenprint can be prohibitively expensive. Each color requires a separate screen, and additional cost. In large quantities however, screenprinting is almost always the most economical solution since it is a mass production technology. Typically screenprint is fairly long lasting, but when it begins to wear out, many will experience cracks and peeling, and look generally unpleasant. Since screenprint uses solid pigment inks, there are no limitations as to what garment colors may be screenprinted, and it can be used on many different fabrics and blends, as well as other items such as mugs, mousepads, etc. Screenprint transfers may be purchased in lieu of creating a screenprint department; all you need is a heat press to apply them and they look, last, and feel just like regular direct screenprinted garments. Depending on the transfer brand used, the quality may actually surpass standard screenprint methods, such as Enmart’s NTRANS product. This is a general category that encompasses a multitude of various types and styles of transfers, and which even technically includes Chromablast. However, the most basic process is to simply use an off the shelf printer, print to a special transfer paper, then using a heat press transfer the printed image onto the shirt or other garment. The image may be anything at all – clipart, lettering, or a photograph. What actually transfers is a film that is on the paper, and when it leaves the paper and attaches to the garment, it takes the ink with it. For the most part you get what you pay for. Using a standard printer and ink with off the shelf transfer paper from somewhere like Staples, will yield results that are acceptable for some, and completely unacceptable for others. Designs may only last for 4 or 5 washings, and the colors may not be as bright. Purchasing a solution that is designed more specifically for doing these types of transfers will yield better results. Some transfer papers allow for printing and transferring to dark garments. Since almost all transfer paper has a carrier film that leaves the paper and goes over onto the garment with the ink, unless you trim the paper up to the design edges or close to it, you will transfer all the extra film from the paper over to the garment. Many find this extra film residue on the garment unacceptable. Still others find the feel of these transfers to be undesirable as well. Self weeding paper is available at some extra cost, which will transfer over the design but not the extra film. Transfers yield mixed results depending on who you ask. Some get acceptable wash results and longevity; others don’t. Overall though, transfers are usually the most economical method of doing small quantities of designs onto cotton or blended cotton garments, and are relatively easy for anyone to do. The printers used, depending on which ones, and the brand of ink and paper, may be problematic and require frequent work or maintenance. The good news is that almost any brand and type of printer can be used, depending on the transfer ink and paper. A method for printing photo quality artwork directly onto a tshirt or other garment using pigmented inks, this allows for printing white or colors onto any color shirt, even black. The process here is a bit more complex. Depending on the system, ink used, etc., it probably requires pretreating dark colored garments, or even white garments, and/or pre-pressing. For smaller quantities, this process can be considerably more economical than screenprint, assuming the printer functions correctly. DTG printers fall into 3 generally defined classes (the author’s own personal categories): Kornit, Brother, and Epson. Kornit and Brother both make very good quality, superior dtg printers, that function very very well, and are very very expensive – but you get what you pay for here as well. All other dtg printers fall into the third class – Epson. That’s because no matter what brand of machine it is, they all use Epson printheads, and in most cases even use the Epson printer chassis itself. Since Epsons were never designed to pass large titanium dioxide particles (the pigment that makes white “white”) through their printheads, it is very common to encounter many many maintenance issues. While some people have used these printers successfully, maintenance must be very nearly a religion to get them to work correctly, and even then, the printers require spare parts and printhead replacements periodically. And, while less expensive relative to Kornit and Brother, even the Epson class of these printers is very expensive. The feel of the design is very similar to screenprint when printed onto dark shirts. When printed onto white shirts, the feel is almost unnoticeable. This is a high quality transfer that has a superior feel that is only minimally noticeable, and after 1 wash is even less so. It uses specially developed inks and paper, which when combined onto a cotton shirt in a heat press under high pressure, creates a nano-molecular bond with the cotton that is very nearly permanent and very long lasting. Excess transfer film residue does carry over to the garment from the paper, but is minimally noticeable, and 90% of it goes away after the first wash. This type of transfer is only available for 100% cotton garments, in white or light colors that are lighter than the colors in the design. One advantage, however, is that long lasting full color photo quality images are possible with this technique. This method is similar in cost to many other types of transfers or even sublimation, but is more expensive than the “Staples off-the-shelf types” of lesser quality. Ideal for smaller quantities and one-offs, this method to produce garments is both quick and easy. ChromaBlast is available for some Epson and Ricoh model inkjet printers, although Ricoh is by far the most trouble-free and easiest to work with. Obviously, the method of cotton decoration you choose will depend on the capabilities of your shop, the equipment you have an hand, and what appearance you want your finished garment to have. 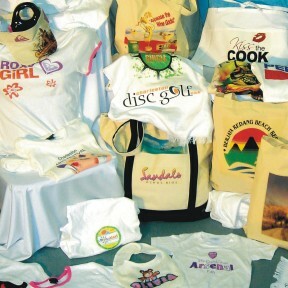 If you do decide that ChromaBlast is the path you want to take, please give us a call, we’d be happy to help you get started using ChromaBlast for cotton decoration.